On Dec. 18, 2011, the last U.S. soldiers left Iraq, nearly nine years after President George W. Bush announced the beginning of military operations in the country. Throughout the course of the war, more than 1 million U.S. troops served in Iraq. The U.S. spent $800 billion and nearly 4,500 Americans and well over 100,000 Iraqis lost their lives. From its beginnings on March 19, 2003, all the way until its end in 2011, the Iraq War was steeped in issues of religion, ethics and values. According to the Department of Defense, 4,409 U.S. military members lost their lives and 31,927 were wounded during Operation Iraqi Freedom. CNN.com maintains an interactive map that shows the names and hometowns of all U.S. military casualties from the wars in Iraq and Afghanistan. The Institute’s Saban Center for Middle East Policy produces an Iraq Index, a statistical compilation of economic, public opinion, and security data. The Council on Foreign Relations (CFR) is an independent, nonpartisan membership organization, think tank, and publisher dedicated to helping their members better understand the world and the foreign policy choices facing the United States and other countries. The CFR produced an in-depth timeline of the events of the Iraq War. Attention to spiritual support for troops grew as more and more returned injured. More than 30,000 soldiers were injured over the course of the war, and 20 percent of those were serious brain or spinal cord injuries. These numbers don’t include the numerous soldiers who suffered from post-traumatic stress disorder (PTSD) upon returning from duty. Support programs are growing, particularly as an all-volunteer army required more use of National Guard and armed forces reserves. In some cases, combat experience has physical and mental health consequences long after a soldier’s duty ends. Congregations, soldiers’ families and soldiers themselves all have stories to tell, while military chaplains have a unique perspective from which to chronicle the role faith plays in wartime. Americans’ determination to support troops during the Iraq war brought greater attention to the nature of injuries suffered by soldiers involved in the war. As with other wars, the war in Iraq brought a signature injury: traumatic brain injury, caused by improvised explosive devices (IEDs). According to the Brookings Institute, 1,756 U.S. military casualties in Iraq were caused by IEDs, almost 40 percent of all U.S. military casualties. Many more were injured and left with traumatic brain injuries. Brain injury poses a major medical — and spiritual – challenge. Mental health issues also affect soldiers and new veterans. Here too, chaplains can play a role in helping the injured and their families. Protest against the Iraq war grew in scope and frequency throughout the course of the war. The historic peace churches – Quakers, Mennonites, Brethren – have always promoted pacifism in war time, but as the war went on, individuals and members of many other denominations joined in the protests. Journalists can help gauge how much influence the protests had, how participation changed protesters’ views, and what kind of protests were most effective. These protests occurred at a time when there was a new openness to the role of religion in politics, and those who have studied peace and protest movements can provide perspective on how these protests compared to those during the Vietnam War and civil rights movement. Protest was particularly prominent during the Vietnam era, but degrees of dissent have marked most major American military actions. Antiwar dissent can be religiously motivated. The Selective Service System defines a conscientious objector as “one who is opposed to serving in the armed forces and/or bearing arms on the grounds of moral or religious principles.” The agency’s website explains the requirements and procedure for claiming conscientious objector status. As the war went on and casualties mounted for both Americans and Iraqis, conscientious objectors, or CO’s, gained a higher profile. Some CO’s started websites, some left the country and many were featured at rallies and anti-war protests. Their stories are unique and nuanced, ranging from newly adopted religious beliefs to patient reconsideration of what beliefs and values mean in action. Each branch of the armed forces processes its own requests for CO status. Anti-war and peace activists in the United States were active in their opposition to the war throughout its operation. Peace coalitions that included many faith groups planned and executed numerous anti-war activities nationally and locally and some even offered training in nonviolence to their members in advance of their demonstrations. Civil disobedience and nonviolent resistance – two tactics used during civil rights-era protests – gained popularity throughout the course of the war. Religious activists used them in a demonstration in a U.S. Senate office building in Sept. 2006, that led to 71 arrests. The war in Iraq and the war on terror in general challenged government policy on detainees and prisoners. The government struggled to balance the need for security in a post-9/11 world with the rights of suspects. That led legislators, human rights activists and religious leaders to press for reform. Concerns about detainees’ rights heightened after the Abu Ghraib prison abuses came to light in April 2004 and after complaints about the treatment of suspects in the U.S. and at Guantanomo Bay. The Iraq war changed just war theory from an academic debate to a mainstream conversation. The war – with the complicating factors of pre-emption, international terrorism, torture, prisoner abuse and more — also challenged the limits of just war theory, a doctrine with roots in Christianity that posits that governments sometimes – but not always — have a morally justified reason for using mass political violence. Experts have recognized that while just war theory is an important tool for analyzing political and military action, the changing character of international conflict required that just war theory and other ethical standards on war be developed beyond where they previously were. The 21st century has brought the bewildering realization that war presents new challenges and new dangers. Political and military leaders, academics, religious leaders and citizens all need a way to talk about wars in order to prevent conflicts, to keep them focused on morally just and attainable goals, and to end them in ways that do not beget more wars – the three principal aspects of just war theory. The Iraq war brought new vigor and commitment to developing just war theory and other forms of ethical debate about war. Just war theory has generally been debated in scholarly conferences or academic journals. But it is not just an academic exercise. It is important because it provides a moral framework for evaluating the reason for starting a war and the way it is conducted. And that moral framework is important because not all wars should be waged, and once they are, an “anything goes” approach to combat can lead to unnecessary suffering, death and, perhaps, more war. The Bush administration’s call for a pre-emptive strike against Iraq caused political scientists, theologians, politicians and military experts to debate whether that call met the requirements of a just war. Different experts came to different conclusions. While some interpreted this as a weakness of just war theory, others saw it as the natural result of the fact that while a doctrine has set standards, different people will apply those standards in different ways, resulting in different conclusions. Many are working to develop just war theory so that it can be helpful in resolving conflicts in the Middle East, Sudan and other places as well as Iraq. The BBC maintains an ethics guide on war as part of their section on religion and ethics. 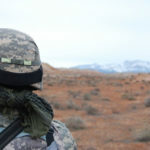 JustWarTheory.com is an extensive guide to philosophical studies of warfare, maintained by Mark Rigstad, associate professor of philosophy at Oakland University. It is a treasure trove of links, information and articles on just war theory. With tens of thousands of troops stationed overseas at any point during the war, a stateside army of volunteers developed to provide them with everything from phone cards to body armor. Many donor groups were religiously based, coming out of well-organized ministries, grass-roots efforts among individual congregations, and groups of friends. Quite a few of these groups sent handmade items – teddy bears, rosaries, prayer beads, cards, food, blankets and more – with the hope that something made by the hand bears more of the spirit of the maker and can form a deeper connection with the receiver. Many of these handmade items also came with a religious message – a CD with a sermon, a booklet with suggested prayers and Bible readings. March 26, 2003, Slate article that outlines the benefits war protests have had for the United States. Article from the July 4-11, 2001, issue of The Christian Century which wrestles with the question of whether military service is Christian. June 28, 2000, The Christian Century article, which argues that military service is compatible with Christianity. Oct. 13, 2006, The New York Times article about Sgt. Ricky Clousing, a Christian soldier who was sentenced to 11 months of confinement for going AWOL during the Iraq war. Beyond the Yellow Ribbon is a Minnesota-based comprehensive program that creates awareness for the purpose of connecting service members and their families with community support, training, services and resources. Contact Chaplain Major Phillip Winn via the BYR website. The International Conference of War Veterans Ministers is an organization of veterans who are also ministers who provide pastoral care for veterans. Contact founder the Rev. Phil Salois from Newtonville, Mass. Strong Bonds is a unit-based, chaplain-led program run by the U.S. Army which assists commanders in building individual resiliency by strengthening the Army family. The core mission of the Strong Bonds program is to increase individual soldier and family member readiness through relationship education and skills training. Contact Carleton W. Birch. Kristin Henderson is an author, Quaker and wife of a Navy chaplain. Her books include While They’re At War: The True Stories of American Families on the Homefront (Houghton Mifflin, 2006). The ELCA maintains a Bureau for Federal Chaplaincy Ministries and provides resources to assist their congregations in providing support for veterans. The Military Chaplains’ Association of the United States of America serves as the professional organization for chaplains of the Army, Navy, Air Force, Department of Veterans Affairs and Civil Air Patrol and includes members of all faith groups. The National Conference on Ministry to the Armed Forces (NCMAF) is a Virginia-based organization that recruits, endorses and provides oversight for chaplains in all branches of the military. Lawrence Calhoun is a professor of psychology at the University of North Carolina Charlotte specializing in posttraumatic psychological growth. He co-edited and the Handbook of Posttraumatic Growth – Research and Practice (Lawrence Erlbaum Associates, 2006). He is part of the Posttraumatic Growth Research Group at UNCC. Richard Tedeschi is a professor of psychology at the University of North Carolina Charlotte specializing in post traumatic growth in survivors of various traumas, including combat. He co-edited and the Handbook of Posttraumatic Growth – Research and Practice (Lawrence Erlbaum Associates, 2006). He is part of the Posttraumatic Growth Research Group at UNCC. The Posttraumatic Growth Research Group is based at the University of North Carolina Charlotte. Their website provides background information and the latest research on the theory of posttraumatic growth. Walter Reed National Military Medical Center is the largest military medical center in the U.S., serving military beneficiaries in the Washington, D.C. area as well as those from across the country and around the globe. The Defense and Veterans Brain Injury Center is headquartered at Walter Reed Army Medical Center and operates at numerous other sites around the country. Walter Reed also offers spiritual support to patients of all faiths. Maurice Isserman is a professor of history at Hamilton College in Clinton, N.Y., and co-author of America Divided: The Civil War of the 1960s. He is regarded as one of the leading historians on the era. Steve Nolt is a history professor at Goshen College in Goshen, Ind., with formal training as a historian in the areas of U.S. immigration and ethnic history and American religious history. He also has significant personal and professional interest in Mennonite and Amish history and thought. An Anabaptist specialist, he has written extensively about Mennonites, Amish and peace. His publications include, as co-author, Amish Grace: How Forgiveness Transcended Tragedy. He contributed a section on peace movements to the Encyclopedia of Religion in American Politics and has said that religious opposition to war is a minority perspective although pacifism acquired more legitimacy in the 20th century. He has said that opposition to the Iraq War was more practical than theological. Ronald Pagnucco is an associate professor of peace studies at College of St. Benedict/St. John’s University in Collegeville, Minn. His research interests include the connection between religion, politics and peace. He has written a comparison of the politics of faith-based and secular peace groups. The Center on Conscience & War is a faith-based organization that advocates for the rights of conscience, opposes military conscription and serves all conscientious objectors to war. Maria Santelli is the executive director. Courage to Resist is a California-based organization that supports war resisters. Email via their website. A comprehensive portal to information about Quakers. The GI Rights Hotline is a group of nearly 20 non-governmental, non-profit organizations located in 11 states and in Germany that provides free, confidential and accurate information on US military regulations and practices to service members, veterans, potential recruits and their families. The Hotline offers information, resources and counseling on conscientious objection. The campaign has been endorsed by religious leaders and groups. Martin L. Cook is the Adm. James B. Stockdale Professor of Professional Military Ethics at the U.S. Naval War College in Newport, R.I.
Gregory Clapper is a professor of religion and philosophy at the University of Indianapolis and a National Guard chaplain. His research interests include Christian theology, ethics; philosophy of religion, Christian ethics, Christian spiritual formation, Wesleyan studies and church history. Clapper wrote the June 28, 2000, article “Wounds of War,” in The Christian Century, where he argues that military service is compatible with Christianity. Christian Peace Witness is an ecumenical, group of partners who are committed to raising a Christian voice for peace. United for Peace & Justice is a coalition of more than 70 groups, including several religious groups, committed to opposing war. Voices for Creative Nonviolence has deep, long-standing roots in active nonviolent resistance to U.S. war-making. VCNV organized numerous campaigns opposing the Iraq war including Occupation Project, a 2007 national campaign of civil disobedience that sought to end funding of the Iraq war. Over 400 arrests occurred in the offices of over 42 representatives and senators (both Republicans and Democrats). Col. Arthur J. Athens is the director of the U.S. Naval Academy’s Vice Admiral James B. Stockdale Center for Ethical Leadership. He has a diverse background spanning the military, higher education, and the non-profit sector. James T. Johnson is a distinguished professor of religion at Rutgers University in New Jersey where he specializes in religious ethics, religion and society, and just war theory. He is considered one of the deans of contemporary just war theory and has written many articles and books on the topic. Contact: jtj@rci.rutgers.edu, 848-932-6820 ext. 9641. David Kinsella is a professor of political science and international studies at Portland State University in Oregon. He is also the chair of the political science division of the Mark O. Hatfield School of Government. His primary areas of research the global arms trade, regional conflict, democratic peace and just war theory. He is the co-editor of the 2007 book The Morality of War: A Reader. Glen H. Stassen is the Lewis Smeades Professor of Christian Ethics at the Fuller Theological Seminary in Pasadena, Calif. He is an expert on religion and social justice and specializes in war, peace and ethics. He wrote Just Peacemaking: Ten Practices for Abolishing War. Michael Walzer is a professor emeritus of social science at the Institute for Advanced Study in Princeton, N.J. He is a prominent expert on just war theory and the author of Just and Unjust Wars: A Moral Argument With Historical Illustrations. James Childress is the John Allen Hollingsworth Professor of Ethics in the department of religious studies at the University of Virginia. His research interests include religious ethics, social and political ethics, biomedical ethics and methods in ethics. He is an expert on just war theory. He has written about Islam, human rights and just war. Reuven Kimelman is a professor of classic rabbinic literature at Brandeis University in Waltham, Mass., where he is an expert on contemporary Jewish life and ethics and the moral meaning of the Jewish Bible. He says a major challenge facing Jews today is finding a cogent Jewish voice on contemporary moral issues. He wrote an essay called Jewish Understanding of War and Its Limits. Robin W. Lovin is the Cary Maguire University Professor of Ethics at the Perkins School of Theology at Southern Methodist University in Dallas where he specializes in religion, politics and ethics. He can discuss just war theory and Iraq. Gerard F. Powers is professor of the practice of Catholic peacebuilding at the Kroc Institute for International Peace Studies at the University of Notre Dame. He also coordinates the Catholic Peacebuilding Network, which links scholars with Catholic leaders from war-torn countries in an effort to enhance the study and practice of conflict prevention, conflict resolution and post-conflict reconciliation. Powers co-edited Peacemaking: Moral and Policy Challenges for a New World. He criticized current military action in Iraq using just war reasoning. Contact: gpackard@episcopalchurch.org, 800-334-7626 ext. 6065. The Prayer Bear Ministry of Sherman, Texas, solicits small donations from people to make simple fabric teddy bears for shipment to servicemen and women at home and abroad. In just one year, the ministry sent more than 20,000 bears to Iraq and Afghanistan. Each bear is prayed over as it is made and has a silver tear, to represent the tears of Christ on the cross, and a gold cross, to represent the light of God. The ministry was founded by Terry Krawitz, an Episcopalian, after the invasions of Afghanistan and Iraq. Soldiers’ Angels offers kits to make “blankets of hope” to send to soldiers overseas. It was founded by Patti Patton-Bader when her eldest son went to Iraq. Sew Much Comfort is a volunteer nonprofit group that sews adaptive clothing for veterans who have lost limbs. Seamstresses volunteer from all over the country. Corky Kuhlman is the president of The Prayer Quilt Ministry, commonly known as Prayers & Squares, an international ministry that performs quilting as a form of intercessory prayer. Many chapters of the Prayer Quilt Ministry make small patches of patriotic fabric to send to soldiers overseas. The Presbyterian Peace Fellowship started in the 1940s as a group that provided support to conscientious objectors to World War II and continue to speak out against war. Rick Ufford-Chase is the executive director. The Episcopal Peace Fellowship began in the early days of World War II and continues to speak out against war in the Episcopal community. The Baptist Peace Fellowship of North America is the largest network of Baptist peacemakers in the world. Contact information manager Allison Paksoy. They developed the Baptist Declaration in Opposition to Present U.S. Policies in Iraq in September 2006. The Pentecostals & Charismatics for Peace & Justice, formerly the Pentecostal Charismatic Peace Fellowship, opposes war in the Pentecostal and Charismatic Christian communities. Contact administrator Natasha Rubin. They urged President George Bush not to invade Iraq in 2003. The Orthodox Peace Fellowship is an international association of Orthodox Christians, located in the Netherlands, who study and advocate on issues of peace and conflict in local, national and international contexts. Their resources include an essay on conscientious objection by Jim Forest, secretary of the fellowship, former Navy officer and a conscientious objector. The Jewish Peace Fellowship is based in Nyack, N.Y. It was begun in 1941 to defend the rights of conscientious objectors. During the Iraq war, they circulated a petition to end the war. Contact: jpf@forusa.org, 845-358-4601, ext. 35. The Middle East Policy Council is a nonprofit organization based in Washington D.C. It works to educate Americans on the political, economic, and cultural issues in the Middle East relevant to the United States.